Brussels International Airport connects to 200 European and International destinations in more than 65 countries. The airport is located at 14 kilometres from Brussels’ city centre and accessible by bus, by train, by taxi and/or car. A second airport, Brussels South Charleroi Airport, located at 45 minutes from Brussels’ city centre adds an additional 100 destinations of the already offered destination from Brussels Airport. More than 60 million Europeans can reach their capital city in less than two hours and in real comfort and in an environmentally - friendly way by high speed trains : Thalys, Eurostar, TGV, ICE. 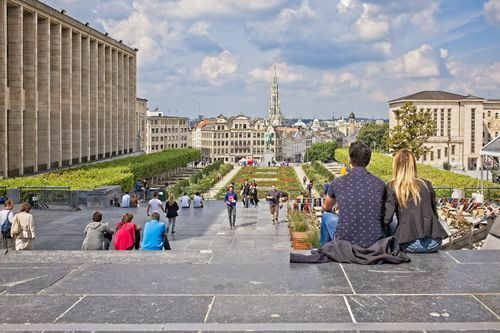 The main point of arrival is “Brussels South Station” from where it is only a stone throw away to Brussels city centre. If you decide to take the car, Brussels is at the heart of a modern motorway network linking France to the south, The Netherlands to the north, Germany and Luxemburg to the east, not to forget the Channel Tunnel (via northern France) to the United Kingdom. Please note that when coming by car, a restriction applies on admission to the Brussels Capital Region. More detailed information on the Low Emission Zone & on how Brussels Expo can be reached can be found on the Brussels Expo website. Thalys brings you in a little more than one hour from Paris to the Brussels City Centre? Eurostar drives you in two hours from London to Europe’s capital? ICE reaches out to Brussels in less than three hours from Dusseldorf, Frankfurt, Bonn, … ? Brussels National Airport is at only 17 minutes from Brussels City Centre, by the ‘Airport Express’ train? STIB/MIVB is the most budget friendly, greenest and safest way to travel within Brussels. The public transport system (metro, tram, bus) covers the whole of the city with buses, trams and metros. Villo! is Brussels' latest system of self-service bikes for hire within 180 stations and 2.500 bikes. Villo! encourages intermodal transport and eco-friendly choices. It takes only a few minutes to start biking.